ceemike...Mike & Judy had the most liked content! I know, I know, it's in a testing phase & subject to change without notice. Central Florida for the winter; Central PA after the snow melts. Thanks for all of the suggestions. A number of them are among our favorites too: Le Cellier, Artist's Point, Brown Derby, Olivia's, California Grill, 50's Prime Time Cafe, 'Ohana. It's been years since we visited the AK hotel, and I'm intrigued by Sanaa since it received 3 votes and we've never eaten there. Does the bread service include all 5 breads, or is it pick one? Which are the tastiest accompaniments? I'm also looking at the Boathouse at DS. It's time to make ADRs for our December trip to the Fort, and I'm looking for restaurant suggestions. 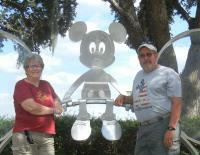 We've been to WDW many times and done most of the usual and popular spots. I'd like to hear from fellow Fiends about their favorite dining spots. Thanks. Using Meal Delivery Services at the Fort? The app shows both FOP and Na'vi River Journey are both temporarily closed. Weather related? I saw this on Facebook, and I was really hoping it was a spoof. Just imagine getting run over by one of these while mom and dad are pushing the little princess at flank speed back to Royal Sommerhus, trying to be first in line to see A & E.
Need a small portable Air Conditioner? This may be your answer! Fifty square feet, a 5x10 room? Well, that takes care of the walk-in closet. Back when dinosaurs roamed Central Florida and Disney issued paper fast passes, I got up real early one morning (probably 8 or 9) and hustled over to Epcot to get Soarin' fast passes for everyone in our group. I had all of our admission tickets with me, and I hoofed it all the way back to The Land, only to find that I could get just one fast pass. According the CM at the fast pass machine, only tickets that had been used for admission to the park that day would work in the fast pass machine. Sounds like In-Park Validation to me. So now, after Disney spends millions of dollars to upgrade to the FastPass+ system, Magic Bands, My Disney Experience, etc., they're just now getting around to adding In-Park Validation? What a bunch of Dumbos. DW would have appreciated the opportunity to enter the park with the fingerprint scanners turned off. She has so much trouble with them that when the plaid wearing CM with the tablet is called over because her fingerprint won't scan, her picture pops up on the tablet so she doesn't have to show her photo ID each time. Many moons ago, (more moons than I care to think about), we took our grandsons to Donald's Breakfastosaurus at Restaurantosaurus. Our ADR was earlier than the opening of AK, so we were escorted to Restaurantosaurus down that very same path through the backstage area. Yeah, I didn't think Birthday Report sounded right, but I was sooooo excited about getting on the First Page of a TCD TR that I panicked. Now I can cross that off of my BL! First Page TCD Memorial Day Trip Report Birthday Report???? Enjoying the trip report. Good pictures. Has the Fort relaxed its rules about parking on the grass? Last year a guy on a neighboring site got a notice from a park ranger for having one tire of his truck off of the pavement. Sorry to hear the Trail's End pizza hasn't improved. Had one a couple of years ago and it was not good. I like pizza, but I actually couldn't finish it and threw some of it away. Probably the worst pizza I've ever had. Challenge: Where to eat at Epcot??? We love Le Cellier, especially the Le Cellier Signature Poutine and the filet.